Elite's Qubo Power Fluid trainer will automatically adjust to a riders weight, eliminating the need to calibrate rollers and making this trainer quick and easy to get practising with fluid-based resistance.Ideal for competitive riders. This trainer does not come supplied with either the following: Front wheel block, turbo tyre or a trainer mat. You may want to consider this when purchasing this excellent indoor trainer. 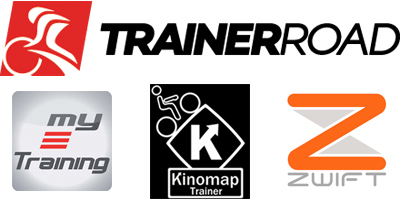 This trainer is also compatible with four third party software platforms to help and make your training session much more fun and realistic. Elite Qubo Power Fluid Trainer is rated 4.7 out of 5 by 69. Rated 4 out of 5 by EllJey from A good alternative to outdoor rides. I bought this in order for me to exercise on cold and/or wet days or when I simply do not have the time to go out. And this fits the bill. My only gripe is that the bar that attaches the drive side of the wheel is quite long. And this allows for a rather disturbing amount of movement when getting on/off and when pedalling off the saddle. Hence only 4 stars. Rated 4 out of 5 by AncientRacer from Convincing no-frills trainer for strong cyclists I have been using the Qubo Power Fluid for at least 140 hours, so this could be considered a long term review. Assembly: Trainer assembly out of the box is very affordable, though not particularly quick. Operation: "Sitting" the bike on the trainer is quick once you get the practice. Once the bike is attached to the trainer you use your own weight to push the back wheel against the roller. (Note that this ingenious system may compromise your out of the saddle efforts!). Fluid brake: The fluid brake unit is very powerful, and the power of the brake increases geometrically with speed as to simulate the increasing air resistance when you gain speed in a real ride. In consequence there's no cables of any kind to control the resistance, so you have a clean, realistic and uncluttered operation. The lack of cables also makes the unit easier to move around. While powerful enough for the most demanding cyclists the fluid brake of the Qubo seems to loose effectivity when hot; that is, you'll get a higher speed for the same effort after you've been hammering hard for a while. (I don't have power/speed numbers to measure exactly the loss of resistance, so any would be welcome). Noise: The Qubo trainer is quiet enough. That said, my unit has always made a grating ("grrr") noise that probably should not be there. It is not annoying, but could be a sign of poor quality control. Frame: The frame of the trainer is made of a metal tube core attached to plastic "skirt" or shell. The frame does its job, has a small footprint, but should be sturdier and less plasticky in my opinion. Advise: to further stabilize the jig and damp vibrations set the trainer on a thick rubber mat and use scrub sponge pads under the trainer feet. Sorely missed: The product box should include a basic front wheel raiser, but it doesn't. A bit of a fail, then. In conclusion, a convincing basic trainer --not "smart", or "fun"-- with an powerful brake unit and a passable frame targeted to strong cyclists; no excuses for not including a basic wheel raiser. Does this turbo need to be plugged into the mains for it to work? No, there is another very similar unit called the Elite Qubo Wireless Digital Trainer which needs electricity. The trainer will come with a QR skewer if needed. We would recommend that you use a trainer tyre as they are much quieter and will not wear out quickly. Is there anyway to track performance on this, or is it just regular bike computers? For this trainer you would require a standard cycle computer. I understand that the resistance is based on the weight of the rider, as my weight is not going to change whilst I ride, how do you change the resistance? For example the resistance would need to be higher if I wanted to do a hill training session or lower if i wanted a flat profile ride? Is it possible to change the resistance mid training session? It's a little confusing, what I think Elite mean is that a heavier rider will put more weight on the roller than a lighter rider. This doesn't seem to change the actual resistance of the unit as that's done by the fluid inside the chambers it flows through. Will this turbo trainer be safe to use with a Boardman Team Carbon frame? Different manufacturers have different views on using trainers with carbon frames but from my experience as long as you aren't doing high power out of the saddle efforts then carbon frames won't be unduly stressed when used on a turbo trainer. Your Boardman should be fine. I may want to use this with both mountain and road bikes and so wondered first if I need to use a block to support the front wheel and if I do whether the Elite block fits both road and MTB tyres. Also, do I need to fit a special tyre to the rear wheel? I have a fixed wheel and so just wondering if that will be okay on this trainer? I can confirm that for the front wheel we advise the Elite ElastoGel Travel Front Wheel Riser Block to hold the bike level and stable. For the rear wheel we would advise a tyre like the Schwalbe Insider Turbo Trainer Tyre (MTB) Folding as it will extend the life of your normal tyres and the trainer. I hope this helps. Can I use this if I have quick release wheels and disc brakes? This would work without issue, but use the quick release skewer that is provided with the trainer for the best results. how on earth do you assemble this equipment. the instructions are completely indecipherable. i need help badly not sure how the reviewers found it all so simple??????? Screw the resistance unit onto the frame with the two screws provided and then off you go. Easy! Zwift - what do I need to buy to use this trainer with it? I realise I need some sort of ANT sensor, but can only find one type on Wiggle, and as a relative newbie I'm not sure if its compatible with this trainer. Would be great if someone could advise, thanks! Is this turbo trainer suitable for climbing intervals at 50 rpm to 55 rpm? It's great for low cadence, higher power work. You can't do this in the same gear you'd use on the road but you get exactly the training benefit you're looking for. You need to be in a higher gear and If I'm doing this sort of workout I'm usually on the big ring and get plenty of resistance.